The Hon. 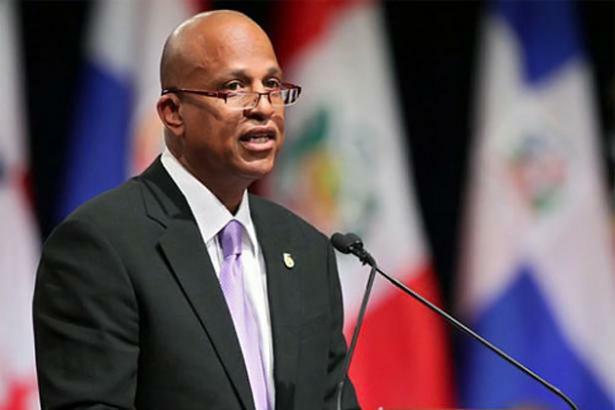 Dean Oliver Barrow was today sworn in as the Prime Minister of Belize, by His Excellency, the Governor-General of Belize, Sir Colville Young. "I, Dean Oliver Barrow, do swear that I will bear true faith and allegiance to Belize; and will uphold the constitution and laws; and that I will conscientiously, impartially and to the best of my ability, discharge my duties as the Prime Minister of Belize, and do right to all manner of people without fear or favor, affection or ill will, so help me, God." Mr. Barrow signed the oath and then the instrument of appointment, which is countersigned by the Head Of State, and with that, Prime Minister Dean Barrow entered his second consecutive term as Prime Minister - the first UDP leader to do so - worthy of a salutary greeting from the Governor General - who once taught the young Dean Barrow. Governor General, Sir Colville Young: "I want to congratulate you and your party for your victory. I trust that it will be a victory not for the party, but for Belize, and that the new term, will be as fruitful for the prosperity and well-being of Belize. Once again, I offer congratulations to you and your team of valued partners." The brief ceremonies were held at Belize House in Belmopan. This is Mr. Barrow’s second consecutive term as Prime Minister. It is expected that the other members of Prime Minister’s Cabinet, as well as other key officials, will be appointed and sworn-in next week.